On January 9, the newly established Italian NGO “Rewilding Apennines” signed a contract with Rewilding Europe, about a 3-year workplan, developed by the two organisations together during the last months of 2013. This after the official announcement the past October during WILD 10, the World Wilderness Congress in Salamanca, Spain, that the Central Apennines have been selected as the sixth area within the Rewilding Europe initiative. It means that a set of rewilding actions can now begin to take place in this so called “Wild Heart of Italy”. Here, just about an hour and a half’s drive from bustling Rome, a crown of limestone peaks reaches an altitude of almost 3,000 meters and in fact conceals some true and unexpected wilderness at the very middle of a very densely inhabited Italy. The central sector of the Apennine range features huge cliffs, caves, deep canyons, some of Europe’s oldest beech forests and a wide range of grasslands – inhabited by brown bear, wolf, wild cat, Apennine chamois, red deer, wild boar, golden eagle, vultures, peregrine and lanner falcons and an astonishing set of endemics. All this enriched by the many evidences of a millenary human history, the charming architecture of the ancient villages and the treats of the local gastronomy, set to create a unique Mediterranean-flavored blend of nature and culture. The present-day wilderness qualities here are the results both of keen conservation initiatives taking place in the Apennines for almost 100 years ( for example the creation of 4 national parks, dozens of reserves, the Natura 2000 network, and the re-introduction of griffon vultures, red deer and the endemic Apennine chamois to areas where they were once made extinct) and of a constant, almost unstoppable, natural rewilding process. Nature is simply re-claiming land abandoned by people that have away from their traditional activities and ways to use the natural resources, in search of more choice in life and maybe more rewarding job opportunities. Indeed the area suffers from a high rate of unemployment and a remarkable emigration towards the big cities, especially among youth. The need for a new local economy and the potential value of the extensive wild areas can turn the present scenario into one of great opportunity instead. You can read more about the vision for the Central Apennines here. The Rewilding Europe partner team in the Central Apennines now consists of a project coordinator, a communications manager, a finance manager, and a rural development consultant. The local team is motivated by a deep love for this region, armed by fresh ideas and an ambitious vision. It aims to ensure the preservation of the rich biodiversity still lingering in the Apennines by improving the ecological connectivity between the existing protected areas and demonstrating a proper and innovative use of the natural resources in these neglected areas, for the benefit also of the local communities. The work will initially focus mostly on areas outside the protected zones or just partly within their boundaries. Areas with communities that see only very marginal benefits as yet from the tourism and business opportunities taking place within the established parks. Yet these areas have a huge responsibility in terms of conservation of the local biodiversity and a great, untapped potential for nature conservation and business development. The Rewilding Apennines team has been working to create local consensus and the active involvement of local administrations and stakeholders, creating a strong interest and expectation. 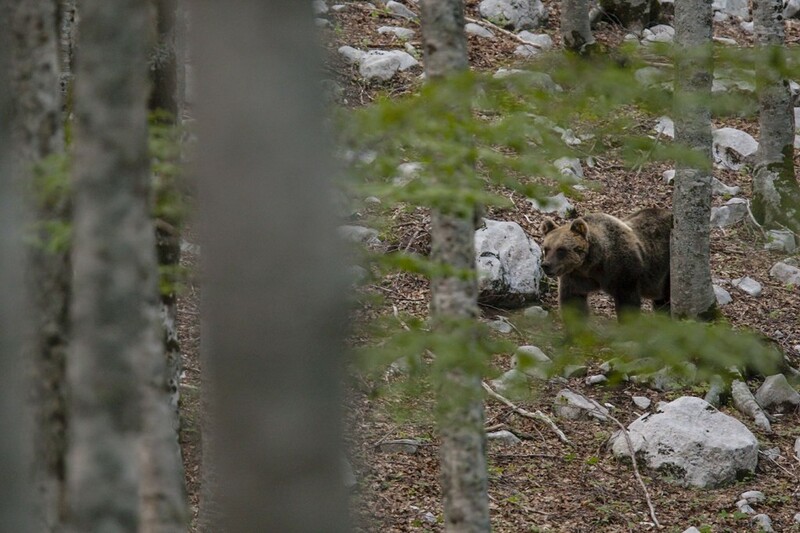 Beginning with the recently established partnership with the Swiss-based Fondation Segré, the first concrete rewilding steps taking place in the Central Apennines will be about urgent measures to help save and protect the endangered Marsican brown bear. With just 50 surviving individuals, this endemic Italian subspecies of bear is in fact on the verge of extinction. This initiative will focus on actions to improve the situation for bears in three communities located at the northern border of the Abruzzo National Park. The first will be a long-term lease of a critical area, in order to eliminate existing problems with poisoning, poaching and transfer of disease from livestock. Secondly, since this area is also one of the best spots in the whole region to actually see wildlife like bears, wolves, red deer and other wildlife, Rewilding Apennines will support the development of wildlife watching tourism here by various means: through technical support from the Rewilding Europe Enterprise Team, through providing support for local investments with help of loans and grants from Rewilding Europe Capital, and by helping businesses to get access to specific rural development funds and the financial market. All supported by communications and marketing at a local, regional, national and international level. If you are interested, please read more about the Marsican bear conservation project here.